High Friction Surface − Wet or Dry. The UPM ProFi Design Deck range gives outdoor living a fresh and modern feel. With a stone-like appearance. UPM ProFi Deck gives outdoor living a stylish new look. The colours inspired by nature, allow deck designs that are fresh and clean. Best of all, once installed, the deck will continue to look great throughout the years with only minimal maintenance. UPM ProFi Decking sets new standards in colour durability. Wood and cellulose fibres are encapsulated in specially selected polymers to provide lasting protection from the weather. The advanced composite technology provides superior resistance to UV, frost, stains and impacts when compared to traditional composite or wood decks. Due to the innovative use of recycled materials, UPM ProFi has won several international awards, and its products make a major contribution to reducing traditional landfill and incineration. UPM ProFi deck boards are made from at least 50% recycled materials and backed by a comprehensive guarantee. High impact strengh. Better scratch resistance. High friction wet or dry. Splinter free warm to touch. MacCann & Byrne is a family run business of over 100 years based in Athboy, Co. Meath. Established in 1906 the company prides itself on the Production and Distribution of the highest Quality Timber and Building Products. MacCann & Byrne promotes Sustainable Forest Management through FSC & PEFC certification. Our standards lay the foundation for all of us to gain the benefits of forests economically, socially and environmentally. UPM ProFi Composite Decking is 100% PEFC Certified. The Company has enjoyed a long standing relationship with UPM-Kymmene Forest Products Division. 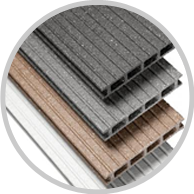 We are delighted to introduce this innovative and exciting range of Composite Decking, manufactured by UPM to the Irish market. The Product range is supported by our In-house Technical team who will be happy to answer your questions. Copyright © MacCann & Byrne Ltd., Lower Bridge Street, Athboy, County Meath, Ireland.